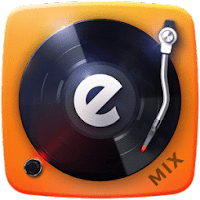 Having won over more than 30 million users worldwide, the world's #1 DJ app that transforms your device into real DJ vinyl turntables finally releases its new version: edjing 5! Create amazing FREE mixes in just a few seconds and liven up your parties, wherever you are. WITH EDJING DJ MIXER, THE DJ IS YOU! - SoundCloud music library: browse your entire SoundCloud library and select the song you want among millions of tracks. - Vimeo access: import songs from Vimeo directly on the mixer and let your imagination run free! - Deezer catalogue: remix more than 30 million songs thanks to a direct access to your Deezer library (for Premium Plus Members only). Mix and scratch instantly thanks to edjing's console and its palette of over 20 DJ effects and functions. Then, share your favorite remix! With the new edjing 5 audio system, the result of five years of R&D, you can benefit for free from the best sound rendition ever developed for Android. - Possibility to use Automix with your own mp3 as well as vimeo, SoundCloud or Deezer tracks. Problems or queries about edjing?